Californians like to live life large, and they like to play it big. 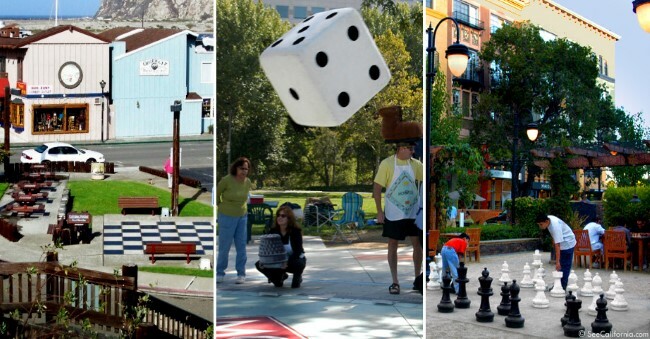 In Morro Bay you can meet up with locals on Saturday and play at the Giant Chessboard (left photo) in Centennial Park or rent out the giant chess pieces during the week through the city parks & recreation department. In San Jose check out the Giant Monopoly in the Park game (middle photo) which is a popular attraction for tourists visiting the nearby convention center. Also in San Jose at Santana Row outdoor shopping center, is a giant chess game (right photo) with the pieces usually available to the public. Surrounding the giant game are chess tables free to visitors.